Graphene Noble Prize went to the Europeans, but will the commercial fruits primarily go to Asians, particularly the Chinese? In this article we demonstrate, based on our recent visits, how China is gearing up to run the show. To this end, we will consider the level of research activity, the rising production capacity, the falling sales prices of graphene, and recent successes in real commercialization beyond just R&D sales. For more information please refer to our report Graphene, 2D Materials and Carbon Nanotubes: Markets, Technologies and Opportunities 2017-2027.This report provides the most comprehensive and authoritative view of the topic, giving detailed ten-year market forecasts segmented by application and material type. The market forecasts are given in tonnage and value at the material level. Furthermore, this report includes comprehensive interview-based profiles of all the key players the industry, providing intelligence on the investment levels, expected future revenues, and the production capacity across the industry and by supplier. In addition, this report critically reviews all existing and emerging production process. Graphene was certainly hyped: no week went by without some laboratory result suggesting that graphene would revolutionize an industry with its superlative properties. The reality however, unsurprisingly, turned out different: graphene commercialization like most advanced materials was slow and not an overnight success. We however assess that the industry will soon turn a page. Indeed, our forecasts suggest a major turning point around 2020-2021, setting graphene on the course towards becoming a $300M market by 2027. Company revenues are going up at rapid rates. This is a positive sign even if, as expected, most are still in the red with growing losses. Companies have also installed substantial nominal capacity. This is real progress too despite utilization rates remaining low. This is because scale has enabled the suppliers to participate in real qualification processes and not just demonstrate performance. The industry has also explored many market opportunities, finally learning to place graphene within its real competitive space and to identify the applications that make commercial sense. The market is however not without its set of challenges. Our statistics show that too many small firms chase too small a market pie with very few generating more than a million dollars annually. Indeed, we assess that many would not stand on their own feet in the absence of direct or indirect government subsidies, suggesting that the conditions are ripe for a consolidation process. The industry also does not have a strong grip on consistent supply quality and the market is still abound with too many extravagant claims. Graphene also remains a substitute material, inevitably making the commercialization more difficult as the incumbents have set a competitive price and performance reference in the market. All this is however very normal for a nascent advanced material technology. We recently visited China to better understand the developments on the ground. As we had written before, the time to be complacent about China is over. It is simply not sensible to dismiss Chinese suppliers as low-quality copycats. Today, China dominates, or will soon dominate, nearly every technology space that we cover ranging from photovoltaics to batteries to 3D printing, and now, as we will show, to advanced materials like graphene. First consider the chart below showing production capacity by company in tonnes per year (tpa). The largest suppliers are Chinese and close to 70% of the total nominal production capacity now resides in China. Evidently, the Chinese suppliers consider scale an integral part of their plans for targeting volume markets. As with rest of the world, capacity utilization here is also very low and the nominal capacity is subject to some exaggeration. Interestingly, direct liquid phase exfoliation is popular in China. The figure below shows that 64% of global production capacity is based on direct exfoliation, whilst the rest is based on rGO, substrate-less CVD (which results in platelet and not film type graphene), and others. 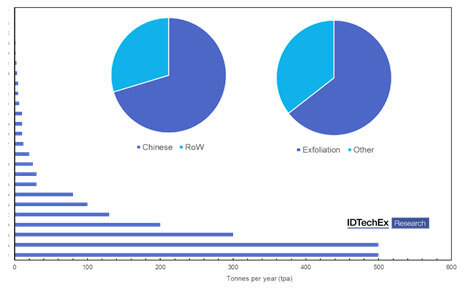 The high share of exfoliation is mostly attributable to its adoption in China where its share well exceeds 80% of the total nominal capacity there. This popularity partly reflects the fact that China started late compared to the first generation of western firms which adopted the rGO method since at the time it was better known and more mature. In terms of pricing also China is amongst the lowest. This is no surprise as typically the prevalent business model has been to go for volume at low costs. The validity of this statement is also shown below. Here, we outline prices quoted by different firms. We highlight the Chinese producers’ prices in red.